A further 2 x payments of £18 + a final payment of £18.50 due. OUR FIRST ARTIST & THEME ANNOUNCEMENT! The one and only JAMIE JONES captains our EL TRIANGULO DE LAS ROWMUDAS megaship at our new home TRENT PARK! Second theme - El Bosque Encantado/ The Enchanted Forest! 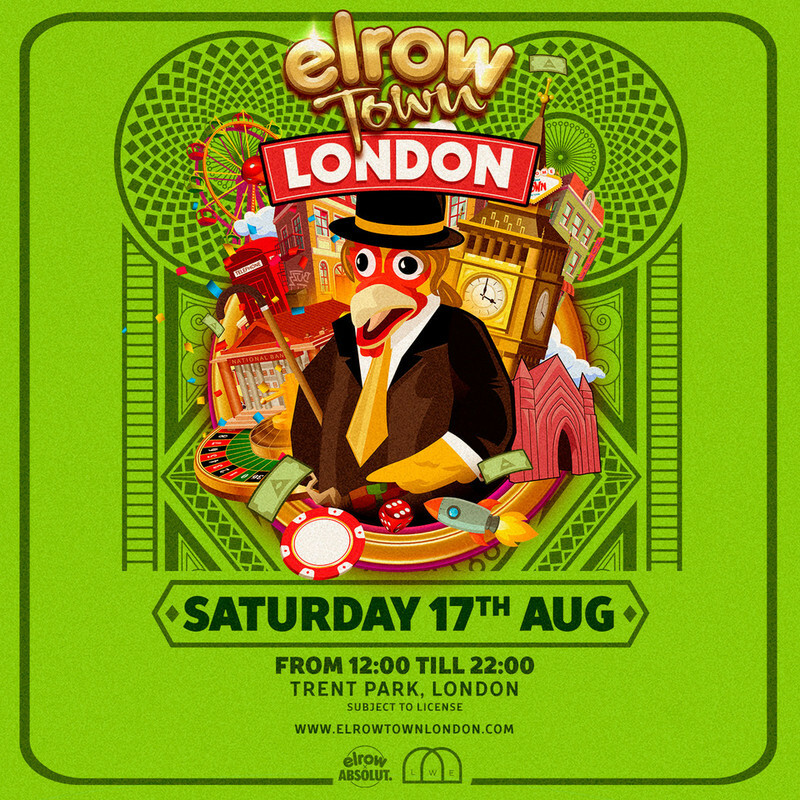 elrow Town London has a new postcode for 2019! Though we love the Capital so much, we're not moving far! Having outgrown the Olympic Park our new home is Trent Park in North London. The geography of the hugely expanded new site means there’s “so much room for activities!” And we do like an activity. Our new home also means we can ramp those volume levels higher than E-V-E-R! ‘Cos louder is better, right? No corner of the parkland or inch of grass will be spared as we fill Trent Park with our unique brand of off-beat shenanigans, high jinx games and peripheral entertainment. And inflatables. Oh yes, there will be inflatables. Of course, the top motive was accessibility, and Trent Park ticks the box being situated within a few minutes stroll of Oakwood and Cockfosters on the Piccadilly Line. This stretch of metropolitan green belt is the ideal combination of rolling fields and hidden enclaves to host the mayhem! That’s not the only change, as we’re also condensing activities into a single day. But that doesn’t mean that elrow Town London will lose any of its pizzazz. It’s just means we’ll be squeezing a weekend’s worth of entertainment into one day which equals twice the fun. And best believe we’ll be cramming everything we can into it. Trent Park will be burstin’ at the seams! If you wish to purchase a ticket to elrow Town and you have personal assistance, we will give your assistant a free ticket. All you need to do is contact us at info@lwe.events with a copy of your ticket (or a confirmation e-mail) and the name, surname and e-mail address of your assistant. They will then be sent a barcoded guest ticket which they will need to provide on entrance to the festival. Don’t be alarmed if the ticket doesn’t come through immediately – we usually collate all the information up until the day before the event and only then send the guest tickets out. Elrow's biggest UK show is back this summer. The first headliner and theme has been announced.